Beautiful Mountain Cabin - Walk into Old Town Truckee. 3 Bedrooms plus Kids Room; Sleeps 10 easily; 3 1/2 Bathrooms. Designer decorated with beautiful but comfortable new furniture. Gourmet kitchen with granite counters and maple cabinets, hardwood and stone flooring compliment the mountain cabin feel. 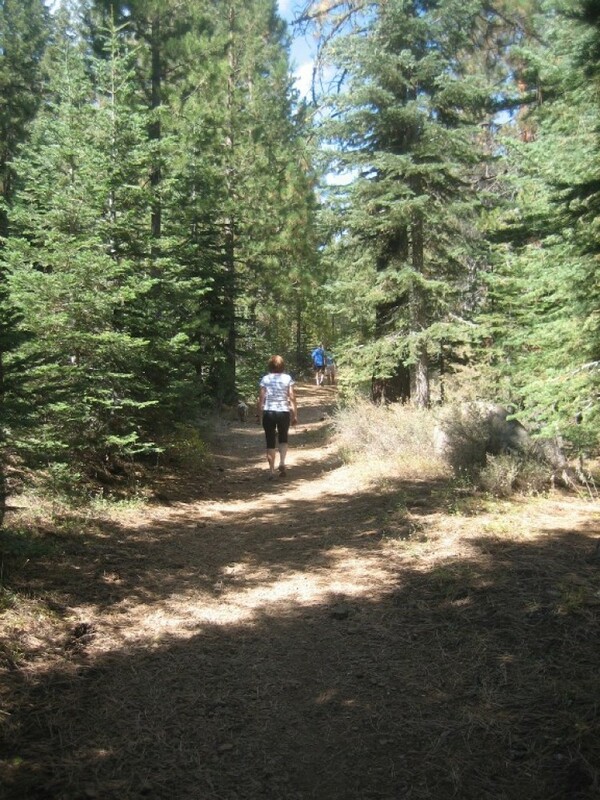 We are located in lower part of Tahoe Donner, nestled on a private drive. Take the trail behind the cabin for an easy 1.5 mile+/- walk, snowshoe or bike into Old Town Truckee with all it's shopping, restraunts and bars. Full size pool table, hot tub, WiFi, 2 flat screen TV's and decks off all the bedrooms that view a peaceful pine setting. Check out the kids' hideaway room with GameCube/DVD/VCR - they will love it and so will you!! Top Floor: The top level showcases a spacious comfortable kitchen/dining/great room with fireplace, TV, and deck/stair access to the front. The gourmet kitchen with granite counters and maple cabinets, hardwood and stone flooring is stocked with cooking utensils, dishes, wine glasses, silverware... Master bedroom has a walk in closet, large private bathroom and Softub Hot Tub outside on the back deck. A separate 1/2 bath for guests is located on this level as well. Ground Floor: The ground floor has 2 bedrooms/1 bathroom + washer/dryer. Each room opens to a private deck. The ground level also includes garage parking for three cars and loads of storage space for skis and other sports equipment. Bottom Floor: This is where the action is for the kids, or can serve as separate quarters for an entire family. Kids love the fun hideaway room with Game Cube and DVD player. Everyone will have a great time in the large family room playing pool, board games, or just hanging out. Includes a flat screen TV/DVD/VCR, surround-sound stereo and a big comfy sectional sofa... mini-kitchen w/ small refrigerator... large, full bathroom with tub/shower. Big deck opens to forest in back with gas Barbeque and picnic table with seating for 10. Lovely house. Lots of space. Wonderful home with lots of space for everyone. We had a great time there is a ton of space! Deborah's place was great. The driveway was a little hard to find since we got in late at night and google maps doesn't direct you to go down the long driveway, but we eventually found the place. Upon arrival, the cabin was impressive looking - Very large and spacious with plenty of sleeping space, a living/kitchen area upstairs with bedroom and 1.5 bath, a middle level with another full bathroom and a couple bedrooms, and lower level that served as an entertainment area with another TV and couch and pool table, along with a few other games to play with. The bottom level had a kids play room/sleep room, which was a little strange for adults, but I could imagine how kids would really enjoy this separate space. Deborah also answered questions promptly and was very easy and nice to work with. Would definitely consider staying here on future visits. Thanks again! As stated in several of the other reviews, the pictures do not do this house justice. It is a very nice house in a great location, close to Donner Lake. It has a great game room in the lower floor with a pool table and a nice stereo system that plays out on the deck as well. There is a deck on each level. The children's getaway was great and our 8 year old loved it. It is located right on the hiking trail that leads to historic downtown Truckee (it was a little difficult to find for us since we didn't know the area but google maps helped). We spent one day at Donner lake with the membership card that was included. This was fairly inexpensive and a nice day. They had water toys of every type for rent and a little fast food type of area. This was very nice as well. We also spent one morning horseback riding, which was very nice. Deborah was very nice and helpful with questions that we had. Overall, I would highly recommend this home to anyone.